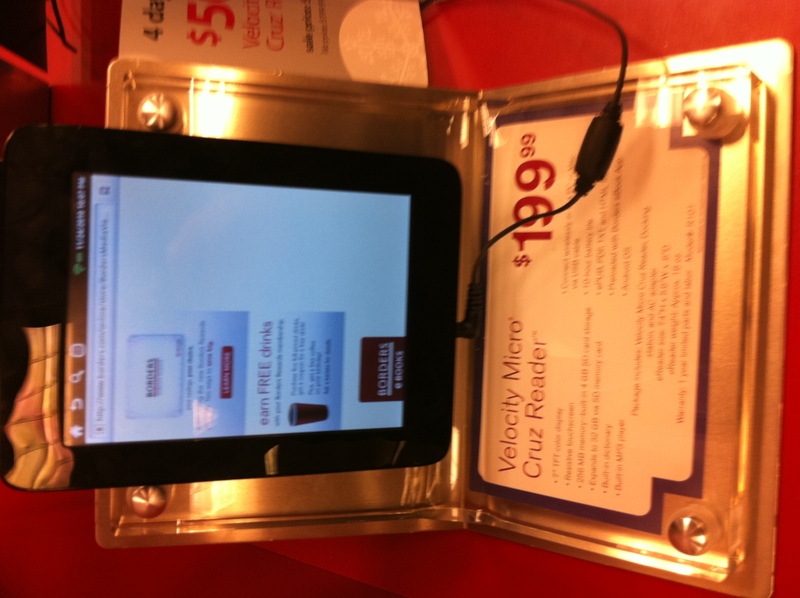 I am sure the Etch-a-sketch style ereaders are fine. I really am sure. But since they can’t offer me a full web experience they are simply not for me. So I went to Boarders, figuring this company is fighting hard to get their heads above water. The one place they can’t less themselves mess up is here in ebook realm. Well, sadly. They did. Something called the Kobo. Basically only etch-a-sketch models. They seemed fine enough the ones that worked. But again, doesn’t meet my needs. I noticed they had a iPad knock-off. Seriously. It was like a kids toy style knock off look to it. Gimme one second while I pull the pic from my phone. Okay, there. LOOK! Man it’s worse in person. The touch pad felt like it was cell phone from 2005. No pinch to zoom (at least it didn’t work) poor response and terrible graphics. I am sooooo sold on the Nook color. Borders once again is committing tech suicide. You are currently browsing the archives for the Border’s Books category.